The dog days of summer! Seattle should reach 100 degrees Fahrenheit tomorrow! I plan on wearing perfume as I work in the garden to keep things alive (my water bill$ make friends shriek and look at me in disbelief). During this week of scorching temperatures, I decided to wear two new "garden" fragrances, one based on citrus, the other on silphium (a mystery plant). Let's start with citrus, "Italian" citrus. 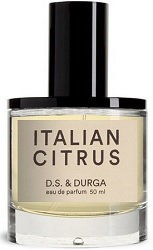 DS & Durga Italian Citrus presents a citrus-lover's dream list of notes: cold-pressed lemon, chinotto (one of my favorite summer soft drinks is based on this fruit), blood orange, bergamot, green mandarin, violet leaf, incense, copaiba balsam, musk ambrette and oak moss. Italian Citrus goes on smelling of warmed (and watery) citrus juice and rind; this scent reminds me of the Moroccan cake we make at my house several times a year that requires the boiling of a whole orange for an hour. After this initial scent of "cooked" citrus, Italian Citrus turns retro; it smells like a citrus cologne from the 60s or 70s (but without the sparkle): there's lemon-orange, a touch of violet leaf. a hint of musk and oak moss. Italian Citrus falls flat; and at $155 for 50 ml it's overpriced. You can easily find zingy citrus perfumes full of lemon, bergamot, orange, tangerine, bitter orange (bigarade), lime and grapefruit...at a fraction of Italian Citrus's cost. Another minus: Italian Citrus is a meek fragrance and disappears quickly on my skin. Next! Swedish line Stora Skuggan sells two perfumes — Fantôme de Maules and Silphium (with a third fragrance to release shortly: Mistpouffer). Thank you, Stora Skuggan for not flooding the market with a zillion perfumes in a few years! Silphium, the plant, was interesting; it was used in ancient times as medicine, cooking herb and possibly as a contraceptive (it may have also been used to induce abortion). The plant grew wild around Cyrene (in Libya) and at times it was valued as much as silver. Many horticulturists believe silphium was a member of the giant fennel family and went extinct due to over-harvesting for the Roman market. Greeks put images of silphium on their currency (as did Cyrenians). 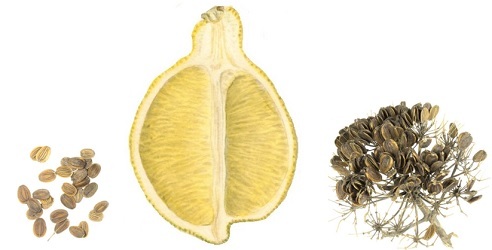 Scholars believe the familiar heart shape (seen most often at Valentine's Day) derives from the silphium seed pod. For Silphium, Stora Skuggan has created a "silphium accord;" other listed notes in the perfume are cinnamon, tobacco, geranium, frankincense, cedar, cistus, black pepper, ginger, clove, myrrh and leather. Silphium goes on with a blast of spice, a scent I'll describe as "hot" cinnamon incense. There's also a distinctive cistus labdanum aroma in the early stages of development, dry cloves, crushed pepper, ginger powder. (Shockingly, the perfume smells like the list of notes supplied by Skuggan PR.) A pleasant mustiness settles over the perfume as it dries down, this aroma reminds me of the smell inside an old wooden spice box a friend gave me that came from northern India. Silphium provides many distinct sensory experiences for me. Depending on the hours after application, I smell like a spice drawer, a medicinal balm, a creamy (but pungent-smelling) bar of expensive soap, and the entrance to a Japanese temple where cinnamon-and-herb-scented incense is burning. As Silphium dries down, many of us who love vintage fragrances may think we're smelling a great Caron perfume from long ago. Silphium's ending comes as a surprise: the scent of a bitter green leaf crushed between your fingers mixing with myrrh, musky leather and tobacco. For those of you in the Pacific Northwest this week: stay cool! DS & Durga Italian Citrus Eau de Parfum, 50 ml/100 ml for $155-$230. For buying information, see the listing for DS & Durga under Perfume Houses. Stora Skuggan Silphium Eau de Parfum, 30 ml for $140, at Twisted Lily. Note: top image of giant fennel from Wikipedia Commons. Image of Citrus limon "Eureka" via USDA National Agriculture Library. Further reading: An interesting article on silphium, the plant: Don't Worry, Darling, I Have Giant Fennel: The History and Mystery of the Plant that May Have Been One of the First Contraceptives, by Susan McCarthy at Salon. Thanks for writing about Italian Citrus, I wanted to try it for some time but didn’t because nearest store with Durga is 350 km away from me, in Warsaw. Lucasai, true, like a custom bowling ball. Is the cap plastic? I think it would be plastic. It’s definitely not stone. L, too bad…I was hoping for enamel on metal at least! Thank you for anothe great review Kevin! About the cap, I’m not sure what its made of, but it’s quite heavy. The bottle is beautiful in person, and feels solid, substantial. I’m quite taken by the scent, it’s not like anything else I’ve ever smelled. There are other more worthier reasons to visit Warsaw! AnnaS, thanks; i love a bottle with some heft. The D S and Durga is so disappointing. I am with you there. I was fascinated by the Silphium but also a little overwhelmed by it. Must retry. I saw the bottle in passing a few months ago but didn’t attend enough to what the top was made of. It felt – or looked – both slightly off proportionally and sort of cool. Amy, Silphium is a BIG scent, that’s for sure! I’ll try these if I get a chance. I haven’t loved anything from DS&Durga since My Indian Childhood, although TBH I haven’t gotten around to trying very many. Noz, agree…like this bottle best so far. I can’t afford either of these, but I sure enjoyed reading your takes! That Silphium cap is so good, it makes me giggle. Wondering if anyone would share their impression of how smokey the scent is from zero (fresh air) to 10 (chimney smoke)? Tiffanie, for me it’s between 4-5. 1) Silphium! I remember learning about this plant in Antiquities in High School, and how incredibly important it was. I wonder if it is truly extant, and maybe just growing wild someplace in Northern Africa, not being bothered anymore. 3) Water is life here on Arrakis! My housemate & I scoop out our bath water so we can tend to the tomatoes & herbs outside! I wish we could do a grey water system at my house! Ede…Portland is brutal this week! Take it easy…. Thanks for the review of Silphium! I’ve been wondering about it. One of my favorite plants in the summer garden is Silphium perfoliatum, aka cup plant, a resinous native of the US midwest that is named for the North African plant, though they’re in different botanical families. It forms a giant clump of 8 ft. tall dark green foliage with cheerful light yellow blossoms that look like sunflowers. An entire ecosystem all to itself, it attracts bees, butterflies, hummingbirds, sparrows, goldfinches, and an occasional friendly toad lurking underneath the dense foliage. It doesn’t have much of a fragrance but it otherwise fits your description of “big personality and vibrancy”. I really need to smell the Skuggan perfume. Kathryn, yes! I saw that plant when I was looking for silphium images. Ah…to see a sweet toad! I’ve tried both SS fragrances at Twisted Lily and love the bottles in person. Don’t recall what the caps are made from but I think they’re heavy. Also don’t recall which I liked better! I think Fantome which was greener? But didn’t feel compelled to own either. Agree they have personality. Thanks, Elisa…the description for the upcoming scent is great. I hope the perfume can live up to it. I’m going to have to order a sample of Silphium very soon. Not only does it sound like exactly my kind of scent–big, spicy, musty, a bit vintage/retro–I’ve also always been fascinated by the history of that plant. Great reviews as always, Kevin.